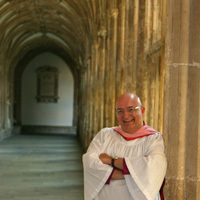 Jeffrey Carter, chair of the Department of Music, is singing and leading his own choral music at two cathedrals in England during July. Carter is on tour with the Choir of Mixed Voices of Grace and Holy Trinity Cathedral (Episcopal), Kansas City. The choir will sing daily Evensong services at Exeter Cathedral, July 11-17, and at Norwich Cathedral, July 18-24. At the daily Evensong services, Carter’s “Forest Park” Preces and Responses will open the service. Says Carter, “In the Anglican tradition, much of Evensong is sung by the choir, giving voice to the prayers of the people. The Preces open the service, and the Responses are sung after the Bible readings and canticles. I’m so delighted that my home parish choir is singing my own music these two weeks.” Carter notes that he will also cantor the services at Exeter. This tour to England is the choir’s fourth, and the third with Carter in the choir. He teaches musical theatre voice at Webster, composes choral music for cathedral and church choirs, serves New Line Theatre as resident musical director, and continues research into the life and work of British composers Herbert Howells and Edward Elgar. Webster Orlando community reletions coordinator Deborah Straubinger has been elected as president of the board of directors for the Central Florida Higher Education Alliance (CFHEA). The non-profit organization is comprised of 30 regionally accredited colleges and universities recruiting in the Orlando market and the three surrounding counties. The mission of the alliance is to promote degree programs and educate employers and prospective students about the importance of choosing a university with accreditation from one of the approved commissions by the U.S. Department of Education. Two Career Planning and Development Center staff members recently received awards from the Missouri Career Development Association (MoCDA) for their contributions in 2015-2016: Assistant director Marcie Schumert received the Member of the Year award for surpassing the standard duties of Past President, stepping in as interim treasurer as well as organizing MoCDA’s annual professional development conference; assistant director Rebecca Nelson received the Volunteer of the Year award for overhauling MoCDA’s website and membership platform which streamlined financial, event, and membership management. A Path to Human Rights and Social Responsibility, may be viewed here. Librarians Heidi Vix and Eileen Condon presented “Data-Driven Collection Review” at the MOBIUS Annual Conference in June.